We’re seeing somewhat of a rally in the markets with most sectors experiencing upward movement. Analysts we interview are quite bullish on the markets and this bodes well for the micro cap executives pitching their stories to investors. This leads me to the topic this month: creating the best presentation. 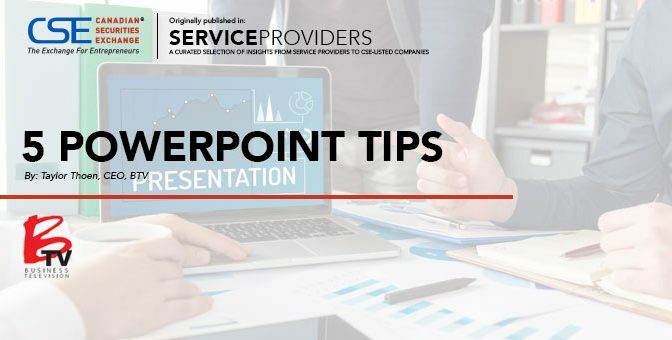 For you savvy IROs and CEOs, PowerPoint hasn’t changed much in the past decade, but it seems many executives are getting it wrong. At a recent trade show, I sat in on several presentations and was shocked at how dismal most them were. This plight led me to create 5 PowerPoint Tips on building a strong presentation. Tip #1: HOOK: Author Sam Horn shared something with me that we implemented in our client branding and it’s been infinitely helpful. She called it “The Eyebrow Test”. If what I say to you doesn’t make you lean in and raise your eyebrows, then I’ve lost you. If you’re confused, you’re not buying. Test your pitch using this method. Tip #2: VISUAL: Use 1-2 pictures or a video snippet to illustrate your business. A picture is worth a thousand words, and according to Forrester Research, one minute of video is worth 1.8 million words. Tip #4: 10, 20, 30 RULE continued: You should speak no more than 20 minutes, or 2 minutes a slide. This leaves you ample time for questions and further explanations regarding your technology, geology, biology, etc. If you’re slated to speak for only 10 minutes, then trim your slides to 1 minute each or combine a few of them. Tip #5: 10, 20, 30 RULE continued again: This refers to your font – it should be no smaller than 30 point font! This forces you to choose words that are more efficient and eliminate fluff and technical jargon that so often appears in presentations. I couldn’t read most of the font at that tradeshow, and I was positioned in the middle of the room. And I’ve had laser eye surgery. Remember, clarity and brevity are beautiful. We often use our Office Manager for our litmus test when creating TV spots for clients. If she raises her eyebrows and leans in, then we know we’ve got her. If she’s furrowing her brows, then we go back to the drawing board. It’s that simple. Good luck with your next presentation; I hope you make it powerful. This story was written by Taylor Thoen and featured in Service Providers magazine.